Fuzzy logic is a mathematical technique for generating a spectrum of values between discrete binary values (0-1, TRUE-FALSE, ON-OFF). These numbers are said to be "fuzzy" in the sense they are indiscrete, inexact, and represent only degrees of precision. What does Fuzzy Logic mean for heaters? 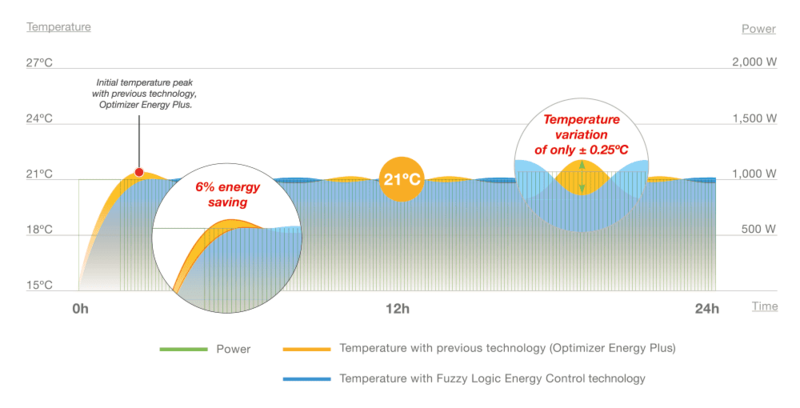 The benefit of fuzzy logic control technology for heating applications is that a heater can provide greater efficiency and therefore lower energy consumption via a more precise calculation of the power required to reach and stabilise at a target temperature. Rather than relying on binary values such as COLD—HOT, a range of temperature can be created with the insertion of a third value, WARM, resulting in three sub-ranges each overlapping its neighbour with fuzzy values. Using these three sub-ranges, a moderate temperature could described, fuzzy-logically, as simultaneously "not HOT", "slightly WARM", and "fairly COLD". Because fuzzy logic produces finer graduations between discrete values of temperature, a heater is less likely to either overshoot or undershoot when making +/- adjustments toward the target temperature along what manufacturers call the "heat rise curve". This greater precision means the heater consumes less energy. Using fuzzy logic control technology, Rointe have achieved a 62% saving in power consumption for radiators in their Delta and Kyros ranges.